Embellished mid length blouse: Yeeeee! I absolutely ADORE this shirt. In fact, it’s my favorite thing that I got yesterday. I’m really excited about this piece because I don’t own anything pure white and I don’t own anything like this shirt in general. I usually shy away from button down tops and blouses because I find them unflattering on me. I’m also not a huge fan of “flowy” clothing because I prefer my clothes to be more form fitting. 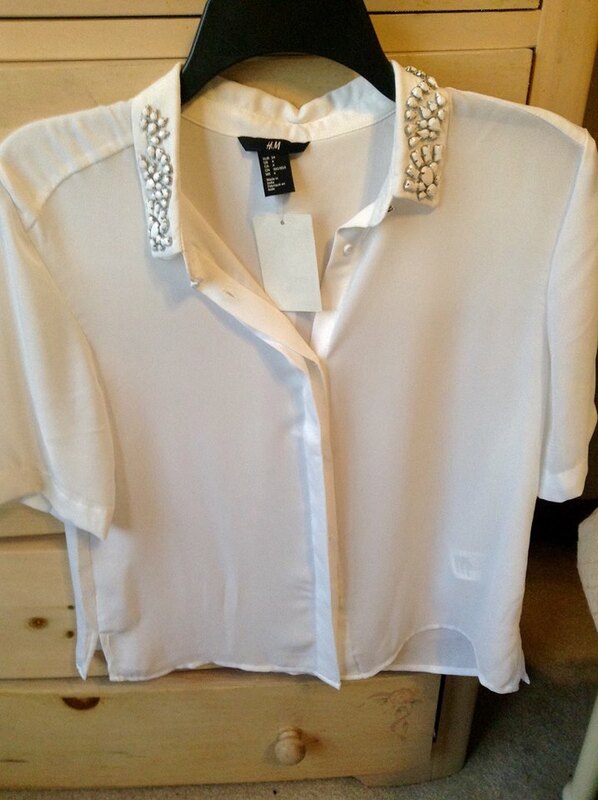 However, this sassy little blouse is too perfect for words. The embellished collar and mid length cut of the shirt gives it the rock n’ roll edge that I always search for in my clothing. The blouse hits right at the waist line of my black skinnies which I love because it shows some skin while you’re moving about. I love clothes that play peek a boo with my side tattoo. This semi sheer shirt is also the perfect one to show off the intentional exposed bra trend which I’m pretty hyped about too! I love this blouse so much that I plan on double checking online if H&M has it in black so I can order it as well. So clearly obsessed! 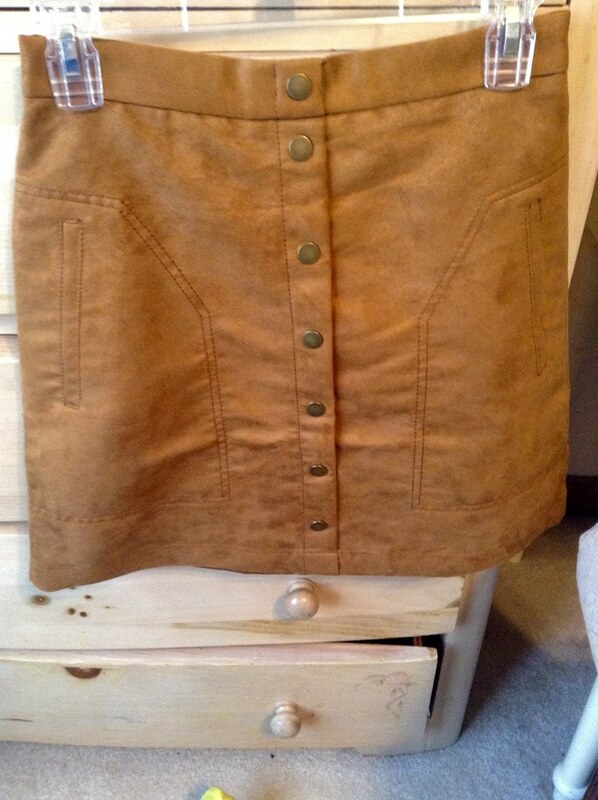 Faux suede skirt: Such a cute little number! I’m not the biggest skirt fan in the world, but I thought this would be a really sweet spring and summer piece that I could easily transition into my fall and winter wardrobe. I really like the cool seam details and the faux suede texture gives it a fun unexpected twist. I’m really excited to pair this with my new embellished blouse, flannels, or just a plain old graphic tee to help dress it up. The deep rusty color of this skirt screams fall to me, so it will be fun to pair this bad boy with knee high socks and a blazer and be on my merry way! 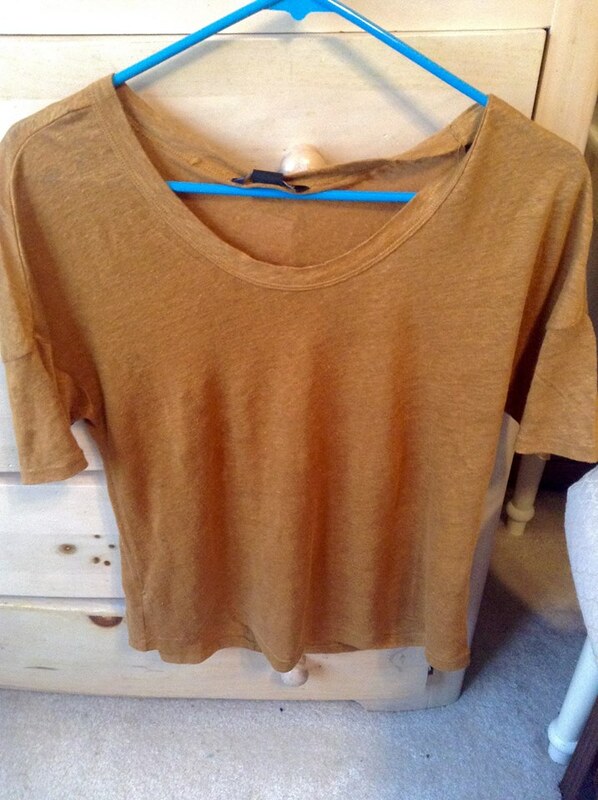 Mustard yellow top: Woohoo! I love this shirt!!!! I got this little linen beauty for seven bucks on the clearance rack, and it was the best money I’ve spent in a long time! I love the way that the mustard yellow color pops against my signature red hair, red lip, and pasty pale skin. Seriously, the color is everything I imagined it being AND MORE! I have so many outfit ideas for this simple top already, from pairing it with my tribal print body con skirt to my navy blue Audrey Hepburn-esque trouser pants this top is going to become one of my go to pieces…I can feel it! I have some really gorgeous Lucky Brand wooden jewelry and a stunning turquoise necklace that my brother got me from New Mexico that will go perfectly with this little baby. The possibilities are endless and I can’t wait to explore them all! As you can see from my fab new purchases it was a very successful trip to Crocker Park! I can’t wait to incorporate all of these new pieces into my looks for many seasons to come! I couldn’t find a pair of shorts that I liked enough to buy yesterday so that’s the last thing I need to complete my spring and summer wardrobe!